New Educational Resource! — Constitute! You are here: Home / news / New Educational Resource! Understanding International Law – Classroom Resources. Another collaboration between the IWRP, BCTF, OJEN and the Law Foundations of BC and Ontario! Find it on the IWRP site – www.iwrp.org. Constitute! 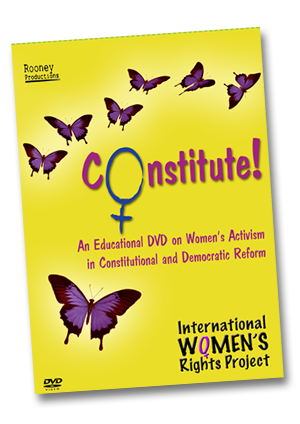 The Film can be watched on this website by clicking on the DVD cover, below; or obtained from the International Women's Rights Project (IWRP) by contacting info@iwrp.org. The Constitute! interviewer Sally Armstrong releases her new book! Dr. Gertrude Fester, a feminist activist, educator, poet and writer from South Africa. Mary Balikungeri, the Director of the Rwanda Women’s Network. Dr. Sima Samar is the Chairperson of the Afghanistan Independent Human Rights Commission. Malalai Joya is a young woman who was an Afghan Member of Parliament for her community.